I'm getting "Oops! Something Bad Happened!" 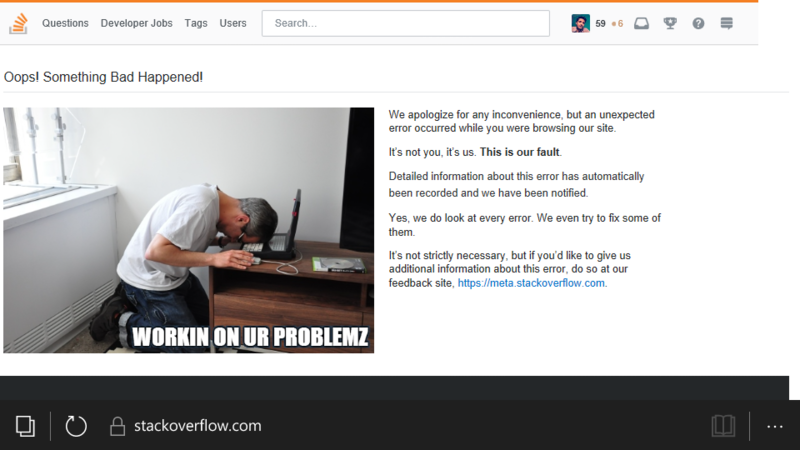 Error, whenever I click on any question on Stack Overflow. It was started a year back but they didn't fix it yet. One of our internal services, Providence, was returning null as a value in one of its collections (eg: ['foo', null, 'bar']). Those values were then being used as lookups in a HashTable, which throws a ArgumentNullException if the key used is null. I added a check inside the loop to handle that case. Home page isn't loading…Oops, something bad happened! Can't access any user profiles anymore: Oops! Something Bad Happened!